If you read Tuesday’s Glory Seed then you know I’ve begun a new chapter in my life’s story so for the last couple of days I have been asking myself where I go from here. If you did read Tuesday’s Glory Seed then you know I have no intention of throwing in the towel. But that does not answer the question as to where do I go from here, not only for me but for the Glory Seeds as well. The answer in short is I don’t know. I say that for a couple of reasons first of all God is good at keeping the path He is leading us on just beyond the range of our vision, and second (related to the first) like all the previous chapters this one is still being written. While reading/absorbing God’s Word yesterday in chapter one of Paul’s letter to the Philippians something he wrote that resonated with me and has since proven to be what I consider a this-is-where-me-and-my-life-are-going statement. “For I fully expect and hope that I will never be ashamed, but that I will continue to be bold for Christ, as I have been in the past. And I trust that my life will bring honor to Christ, whether I live or die.” (Philippians 1:20, NLT) It does not however give a final destination but as Important as my final destination is what I do and how my life impacts the life of those in “my world” is equally important. I know our life situations are much different but what we need to do with our lives not just for ourselves but for God as well shares a common road. 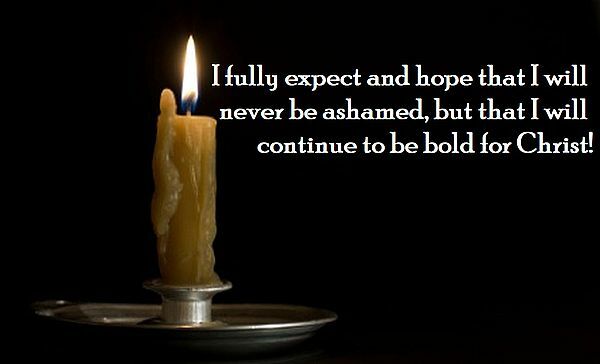 I think it would be wonderful if we could all borrow Paul’s words, “For I fully expect and hope that I will never be ashamed, but that I will continue to be bold for Christ, as I have been in the past. And I trust that my life will bring honor to Christ, whether I live or die,” for ourselves. As Christians we are living a unique life based on the Love of God through the sacrifice of Jesus and brought to us through the Holy Spirit. Earlier in chapter one Paul gave the Philippians these words of blessing, “May you always be filled with the fruit of your salvation—the righteous character produced in your life by Jesus Christ—for this will bring much glory and praise to God.” (Philippians 1:11, NLT) May they have the same life giving, life living impact on our lives as they did to those who first read them. AMEN!